Chore charts can help keep your life organized, teach your child about responsibility and how to be a part of a family. Any given moment in our lives can become a teaching moment, we simply have to take the time. This rule especially applies when we first introduce the notion of household responsibility to our children. A rule of thumb in our home is: "Sharing is Caring". We share our toys, food, T.V. time and so on. We share everything, which also means sharing the responsibilities around the house. At the moment my son Eytan has two 'jobs'. Setting the table and putting the dishes away. 1. Preschoolers should have anywhere from two to four household responsibilities. 2. Chores should be viewed as responsibilities and not as WORK. 3. Do not forget to show your appreciation and thank your child when they complete the task. A little bit of praise can go a long way. Ready to begin? Click here for my Top Ten Age Appropriate Chores for Preschoolers. Display the chores for kids and other members of your family in flower pots. It will definitely add a colorful cheer to your living space. I got the pot bases at the Dollar Store. The art supply is basic: Paper, glue and Popsicle sticks. * Place the pots next to one another in a visual location. This way all family members are aware of the chores other members have. * Give your child the option of choosing some of their chores. * I love using as many visual aids as possible. 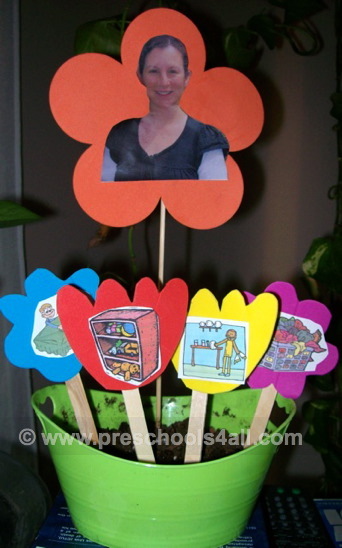 Add pictures of the family members to each flower pot. * You can add the words along with the images and use this chance to begin letter recognition. You can download and print a copy of the job charts by clicking here. If you think a different display will work better for your child check out my other chart ideas on the right column. The thought that we can all use a helping hand made me come up with this simple and age appropriate chores display. 1. Find a picture of your child. 2. You can also make a life size cut out of your child similar to the image on the left. * Display the job charts at the child's eye level. * Make the list of chores interactive by letting your child sometimes choose the 'helping hands'. 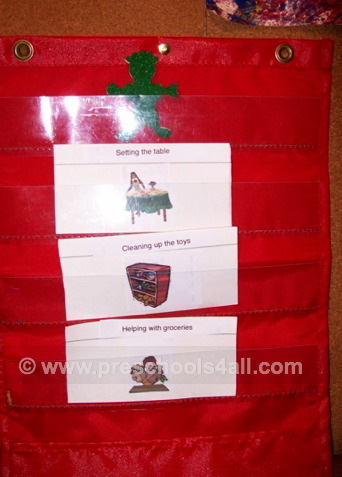 Responsibility charts (also known as job charts) are used to display the chores different children have in the classroom. Everyday we assign our class jobs to five new children. Upon entering the class the kids know to check if their name is written beside the chore lists for the day. They love having extra responsibility in the classroom and look forward to completing their job. 1. Use an erasable board and an erasable marker. 2. Display the jobs on the left side of the board. 3. It is best to include images along with job titles. 4. In the beginning of the year explain the description of each job. 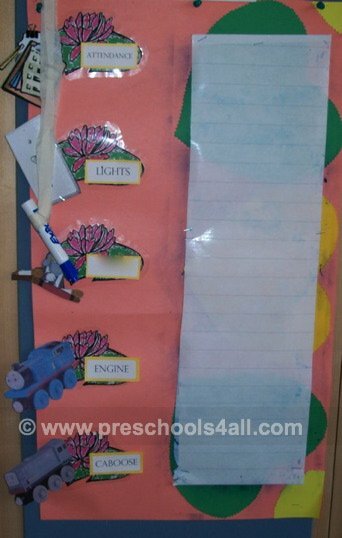 This is a basic kids charts display. It is simple and takes a minimal amount of space. 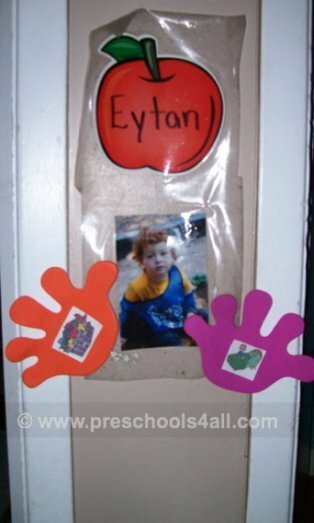 Each child or each family member in the home has a pocket chart. They are available at any school supply store. 1. Create the flash cards by gluing the images and writing the job titles. 2. Give your child the option of changing some of their daily chores by changing the flash cards. 3. Place the chore charts next to one another in a visual location. This way all family members are aware of the chores other members have.